This is a story about love and death. About the power of love to transcend the earthly boundaries of life. Can love truly be so strong as to span lifetimes? Do soul mates carry a special energy that allows them to reunite after reincarnating? Yes. Katia and Alexi are two such soul mates who possess that deep and true love we all dream about. Their stories and lives will not be simple nor easy. Trial, anguish, and separation will be their test, but what they gain will outweigh all they endure. This three-tiered story begins within moments of Alexi and Katia’s demise. They’ve escaped deadly combat after Alexi rescued Katia, and they now bob helplessly in a rowboat on a lake. They relive grand moments shared before their eighteen-month separation. A sharpshooter takes aim and fires. We now revisit what has led them to this place. The date: winter 1854. The place: Terraminsku forest, Soviet-ruled Poland. Ambling along a path en route to Katia’s cabin, Alexi hears mounted Cossacks behind him. He hides, escapes and ends up at Katia’s doorstep. Against her intuition, Katia is convinced to join Alexi in an innocent scout of a forbidden region of the forest, the swamp. A reckless and powerful prince, Leonid, has tracked the two lovers, and watches as Katia falls into the swamp and nearly drowns. The prince confronts Alexi as Alexi attempts to save his sweetheart, and a sinister trilogy of destiny has been formed. The two young lovers leave the swamp not realizing that their actions have sealed their fate. Time of change permeates the forest. Alexi’s father, Pietrov has had enough persecution and decides it’s time to take his family away. America seems like the right place. Pietrov secures (illegal) passage and Alexi decides to rally one last time against his oppressors. Alexi chooses one horrid stormy night to venture again into the swamp and teach the Cossacks a lesson. He is led by his heart, and comes close to Leonid’s camp, but stumbles near his enemy and is saved by a Polish freedom fighter, Ludmilla Petrashevsty. Ludmilla leads Alexi to the cabin of renowned and legendary Polish poet, Zygmunt Krasinski. But Leonid and the Cossacks close in, and Alexi and Ludmilla narrowly escape. The Cossacks blades are razor-sharp. This rainy night could easily spell death for the young love-struck Alexi Kowalski. Krasinski is captured, and the night’s foray comes to a climax as Ludmilla’s freedom-fighters (with Alexi in tow) do equestrian battle, in the forest by the swamp, in the pouring rain. Krasinski is rescued, and Alexi has had his first taste of battle. Leonid is not killed, but becomes more incensed by this misstep within his own backyard. He plans something; we know not yet what. Alexi’s plan didn’t work. He must sit Katia down and tell her their lives together are over. He vows to do what he can to succeed in America and prays that his will and heart will lead him back to her arms. She says she’ll wait for him. The Kowalski’s pack up a two-wheeled cart and haul their belongings out of the forest, to a dirt road, toward a train station fifty miles away. The dreams and telepathy between Katia and Alexi persist, hers of savior, his of rivalry. Terraminsku is now behind them, and the Kowalski’s dream of the land of freedom. But their trials are far from over. Pietrov’s false papers are accepted on the train, and after disposing of all their lifetime’s worth of belongings, the family rattles along the rattly rails toward the north sea, eight hours away. A ninety eight foot sloop bobs off a rickety pier. This will be their home for nearly three months. They climb the plank, enter a two by two foot hatch and descend thirty feet down a wooden ladder – and enter the hold. Just inches from the sea, the hold is dark, cold, rotten, and incessantly moving. Their only solace – others like them, fleeing persecution, seeking freedom. Alexi’s dreams of Katia continue. It seems the farther they drift apart, the closer they come in heart. But now it’s time to buck up, lift the head, and make the best of it. Alexi is handed pencil and paper from a group of men and appointed the voyage’s official journalist. He is slow to start, but derives inspiration when he pulls a rumpled letter from his pants and reads a note from Krasinski. The letter from the forested sage seems to probe Alexi’s heart, and he is inspired to venture up top, where he meets the ships’ skipper, Billy Bang. Billy feels something for this audacious boy, and brings him on a daring shark hunt in a longboat lowered from the ship. A shark is caught, and Alexi uses a tourniquet to stave off death after the twelve-foot animal bites the skipper. Billy bears well for a time, but his wound is too deep. He does not survive his trauma. Alexi has another loss to bear as he is called to witness the passing of a new heartfelt friend on his adventurous passage to America. The voyage does finally end, and as the ship docks at Crystal Garden, the quarantine station and last stop before the New York City streets, Alexi takes a moment to look at this adventure from the high view- to peer back- look at what all this has meant. Love and death. Fear and bravery. Heart and head. He writes in his journal that he now knows these are conflicts he will continue to confront so long as he is strong enough to answer his call. 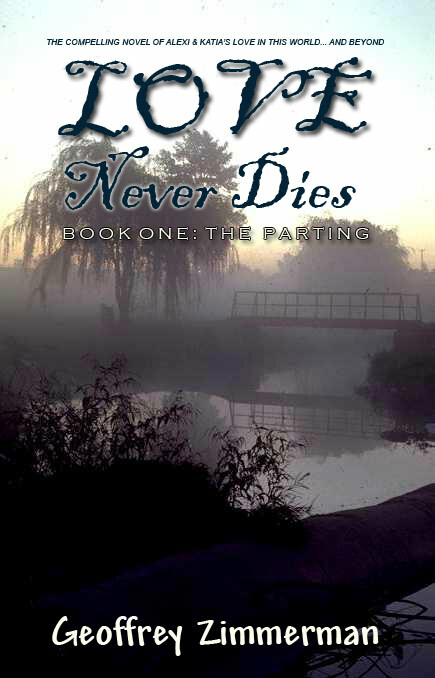 I recently read the first version of Love Never dies, and I found it to be a timeless story, rich in description which captivates the reader from the moment Alexi and Katia meet. Much like Romeo and Juliet, these star crossed lovers transend time, leaving the reader with the impression that they will find eternal love. Geoffrey Zimmerman’s novel “Love Never Dies” really captivated me. I didn’t want to put the book down. It was as if I was a part of the story. I really never knew what to expect from chapter to chapter. It was never predictable or boring. I laughed, cried, feared, and was excited while I read this book. Geoffrey managed to describe each scene in such a way that I was pulled in and could really relate with what the the characters were experiencing. Alexi and Katia almost seem like old friends of mine. They will always be in my heart. I do hope you will read this fantastic romantic exciting story if you get a chance. Thanks Geoffrey, for the opportunity to read this book. Keep up the writing. Please feel free to post what I wrote, up on your web site.